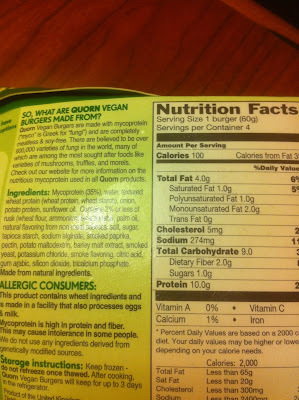 Marty's Flying Vegan Review: Quorn's New Vegan Burgers ... where's the beef ... or what? Quorn's New Vegan Burgers ... where's the beef ... or what? Now I am not a nutritionist by license or course of study but I have read more than a shelf load of books about nutrition and diet and agriculture and the food supply and I can't for the life of me figure out what PLANT BASED INGREDIENT CHOLESTEROL CAN COME FROM. (caps off). So I'm going to write to Quorn but for now my eyebrow is up. (Not a unibrow, just one of them in a skeptical sort of look). If anyone knows the answer to this conundrum, please chime right in. Vegan failure is Vegan progress.